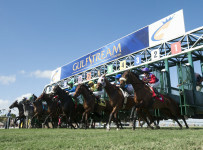 Conditions are listed as Fast and Firm for Saturday’s 12-race card at Gulfstream Park. First post is 12:00 p.m. 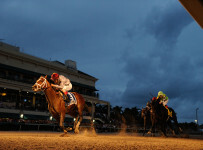 The Weather Channel forecast is for a chance of rain ranging from zero to 15 percent during racing hours. 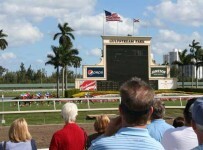 The feature race is the $350,000 Holy Bull (Grade 2) at 1 1/16 miles on dirt for 3-year-olds. It is the 11th race with scheduled post of 5:13 p.m. The ninth race is the $100,000 Forward Gal (Grade 3) at seven furlongs on dirt for 3-year-old fillies. 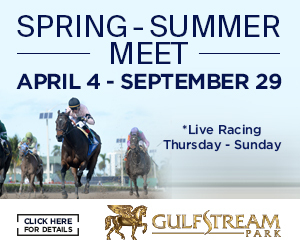 The 10th race is the $150,000 Swale (Grade 3) at seven furlongs on dirt for 3-year-olds. We will have coverage this afternoon and night on our blog. which can be accessed on the menu bar at the top of the home page of this Web site.